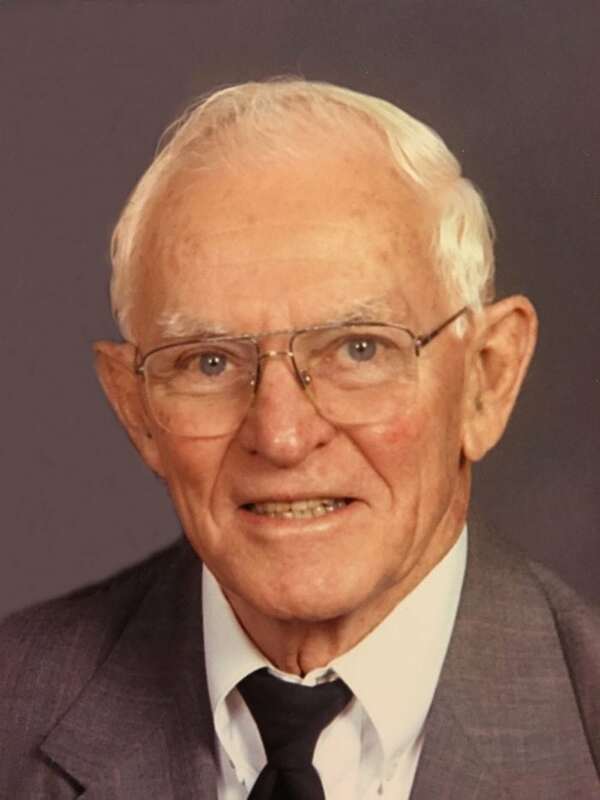 Jake Melvin Froehlich was born May 25, 1922, near LaPorte City, the son of Jake R. and Zilda “Louise” (Moffitt) Froehlich. He played basketball and football at Traer High School graduating with the Class of 1940. Jake worked in grocery stores before entering the United States Army, proudly serving his country in the 102nd Infantry Division (Ozark) from November 1942-February 1946. He served abroad in combat in the Rhineland and Central Europe. Jake rose to the rank of 1st sergeant receiving 2 Bronze Battle Stars and a Bronze Star Medal. He returned to the Traer area where he worked as a carpenter. Jake retired in 1984 after many years of working for Stan Dedic. In 1953, he was united in marriage to Elinor Elizabeth Dalziel at the Little Brown Church in Nashua. Jake was a sportsman enjoying hunting, trapping, fishing and softball when he was younger, then coaching softball and little league baseball. He and Elinor were members of the Traer United Methodist Church and enjoyed gardening and watching the Chicago Cubs together. Jake was also a member of the International Order of the Odd Fellows faithfully attending meetings and serving as the Recording Secretary for many years. He had a warm sense of humor and enjoyed doing odd jobs for older family, friends and neighbors. Jake died at the age of 96 years on Monday, October 1, 2018, at Sunrise Hill Care Center in Traer. He was preceded in death by his parents; his step-father, Walter Fox; his wife of nearly 65 years, Elinor; two sisters: Mary in infancy and Zilda “Helen” Froehlich. Jake is survived by a son, Bob (Sandy) Froehlich of Savanna, Illinois; a daughter, Coleen (Dan) Kelenske of Little Rock, Arkansas; a sister-in-law, Sandy Dalziel of Ainsworth; and other beloved family members and friends.